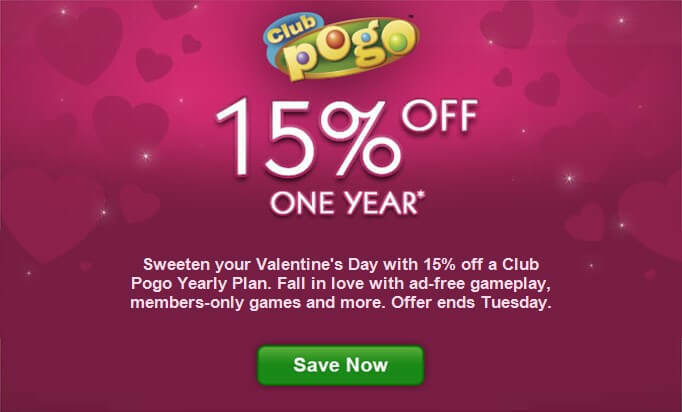 From now through Valentine’s Day, save 15% off one year of Club Pogo. THIS “$6 OFF (or 15% OFF) A YEARLY CLUB POGO SUBSCRIPTION” OFFER IS BEING ISSUED TO YOU FOR PROMOTIONAL PURPOSES ONLY AND DOES NOT CONSTITUTE A CREDIT, CHARGE, DEBIT OR GIFT CARD. This offer expires February 14, 2017 11:59PM PST. Valid with 1-year (12 continuous months) subscriptions for first-time and re-subscribing Club Pogo members with accounts activated on February 11, 2017 on credit card and PayPal purchases only. Current Club Pogo members excluded. Limit one offer per person per Screen Name. The USD $33.99 fee (plus any applicable taxes or inclusive or applicable taxes based on billing address) for the first yearly period will be immediately charged to your credit card, debit card, or PayPal account at the time of purchase or after the free trial expires (if applicable). This plan will automatically renew at the end of the yearly promotional period to the USD $39.99 yearly recurring plan. This offer may not be substituted, exchanged, sold or redeemed for cash or other goods or services. This offer cannot be combined with any other offer, Gift Card, rebate or other discount Coupon. Void where prohibited, taxed or restricted by law. To take advantage of this offer, use the coupon code VDAY15EM at checkout. BadgeHungry is not an affiliate of Pogo/Electronic Arts and receives no compensation for purchases made through links in this post. Without new members there wouldn’t be a Club Pogo for very long. Almost every company gives a better deal to new members. It’s just the way it is. They gave out more things to Club Pogo members last year than ever before. Every time you turned around they were giving us badges or mini items. The 15% off is worth $6, the same cost as 100 gems if you buy the largest package available. Last year Pogo gave us 11 Mix & Match Badges, 16 free episodes to various games, and a lot of mini items…..worth a lot more than $6. I’m not including what you get if you have it set up for auto renew b/c not everyone does that, but that alone is worth over $6. are free gems included with this promo or does that apply only to those paying full price? You only get 100 gems when you auto renew, so anyone that is new wouldn’t be eligible for the 100 gems until next year. But if it’s a truly new account, never been Club Pogo, they would get 20 free gems. This is kinda off topic, but has anyone noticed that all the games now have no spinner?? So no kind of winnings. No tokens, no cash(even tho its usually small), or gems, Wallpaper. or is it just me? That’s not true. I just won $50 last week on my 3rd account in Crossword Cove. Congrats on your win. Sorry I meant the new games. You do get tokens tho, but no spinner. That started a few years ago with phasing out the JP spinner. im glad that pogo is offering some kind of savings to new members..helps to keep our membership fees from rising..